Hurry on over to Facebook and LIKE the Brit PetFood USA Page to snag a FREE sample of their Petit Cleans Teeth Healthy Snack. 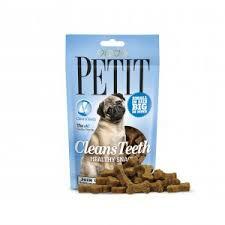 It’s a dog treat that cleans teeth, reduces tartar and helps prevent plaque creation on your dog’s teeth and gums. The free dog treat sample offer is good for US residents only and is subject to availability. Go HERE to get your free sample! 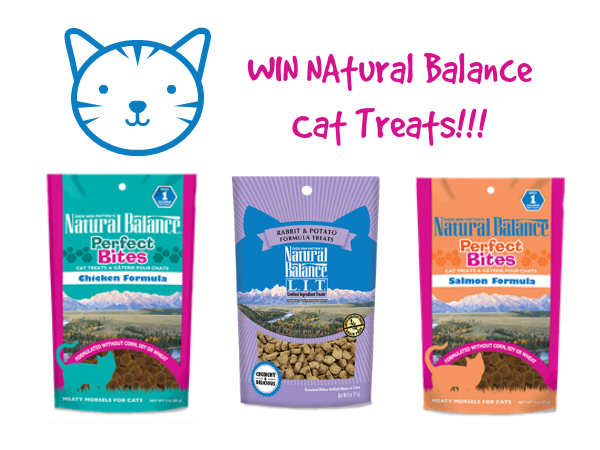 We love our feline friends and don’t think that dogs should get to have ALL the fun…so we arranged for our blog sponsor, Natural Balance, to let us give away some of their yummy cat treats! Natural Balance cat treats come in L.I.T. (limited ingredient treats) and Perfect Bites varieties with no artificial colors or flavors. Flavors include Chicken, Rabbit and Salmon, so you are sure to find one or MORE that your cat will love! It’s super easy to enter the giveaway: just head on over to the Woof Woof Mama Facebook page and leave a comment telling us a fun fact about your cat. You must be a US resident and enter by 11:59pm ET on Monday. We will randomly select 3 winners from all the eligible comments and they will each receive 2 bags of Natural Balance Cat Treats! Go HERE to enter on Facebook. Go HERE to visit Natural Balance and learn more about their treats for cats and dogs. I’m super excited to be participating in this Influencer Activation on behalf of Mom Central Consulting for State Farm. I received a promotional item to thank me for helping spread the word about how you can get involved in this fantastic neighborhood initiative. Read on to learn how to vote for causes YOU care about, so they can receive a $25,000 grant to support the work they do in local communities! Communities across the United States and Canada answered the call from State Farm to help create a positive impact in their community and submitted 4,000 causes as part of this year’s State Farm Neighborhood Assist. Now the top 200 causes have been selected and they need you to help vote them into the top 40. Now through May 16, everyone can vote daily for their favorite cause, or causes, and help bring $25,000 to each of the top 40 vote-getters. 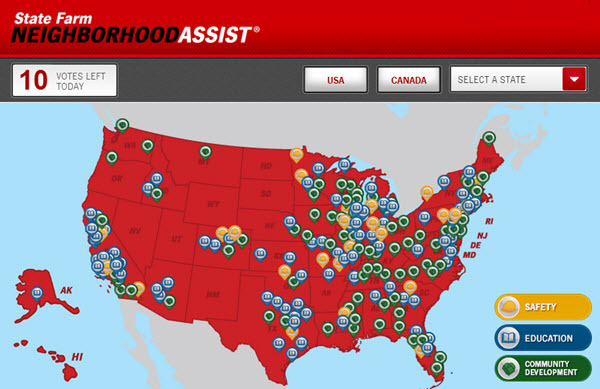 It’s super easy: just use the free State Farm Neighborhood Assist Facebook app to cast your votes! You can cast 10 votes per day — use them all on one great cause that’s nearest and dearest to your heart, or divide up your 10 votes among any of the top 40 finalists throughout the United States and Canada. Browse them using the map, or search by interest or type of cause you care about. Pretty inspiring, right?!? Well, it’s time to help choose this year’s winners. Head on over to Facebook and vote daily to help decide which 40 groups will each get a $25K grant to support their programs. There are SO many worthwhile causes! 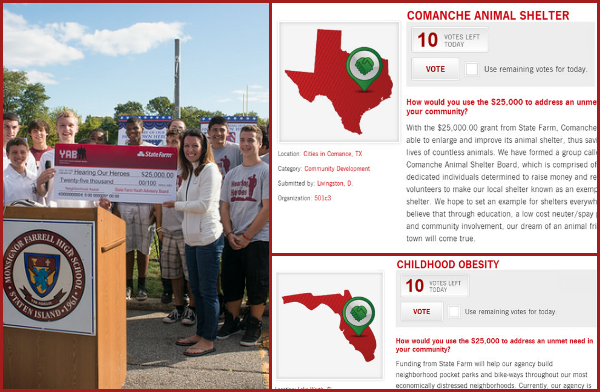 I think I’m going to split my votes between the Comanche Animal Shelter Project in Texas and a Childhood Obesity program right here in South Florida. Drop whatever you’re doing (unless you’re scooping poop; that could get messy! )because I’ve got super exciting news for all you dog parents, and you are NOT going to want to miss it! To celebrate the launch of their new holistic LiveFree dog food line, Dogswell is having a very special contest and one lucky dog is going to WIN Free Dog Food for Life! Yep…for LIFE! That’s one bag of LiveFree dog food (up to 28 lb. size; Maximum ARV: $64.99) and one case (12 cans) of LiveFree dog food (ARV: $40), per month for the natural life of winner’s dog. It’s Dogswell’s new holistic line of ultra-low glycemic, grain and potato free food for dogs, available at independent pet retailers across the United States. LiveFree is high in animal protein sources to align with a dog’s natural diet. The ultra low glycemic recipe prevents spikes in blood sugar levels and supports slower digestion and sustained energy for proper absorption and healthy weight. LiveFree is free of grains and potatoes, which are common high glycemic fillers. LiveFree is available in dry food (chicken, lamb, salmon, turkey recipes) and canned food(chicken, lamb and salmon stew recipes) for puppy, senior and adult dogs. To summarize: just post a photo (to Facebook or Instagram) of your dog cutting loose, living free and doing funny dog things. Be sure to use the hashtag #LiveFree4Life to be eligible AND to check out all the other entries! That’s it! 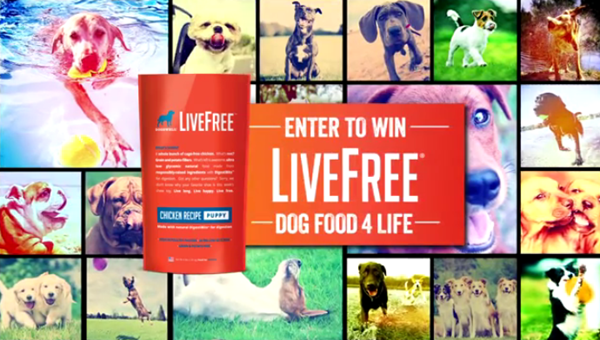 You can CLICK HERE to visit Dogswell’s LiveFree sweepstakes page on Facebook. And here’s the official contest rules if you want to check them out for yourself. This post is sponsored by Dogswell LiveFree. We only present info, products and promotions that we feel will be of value and interest to our readers! 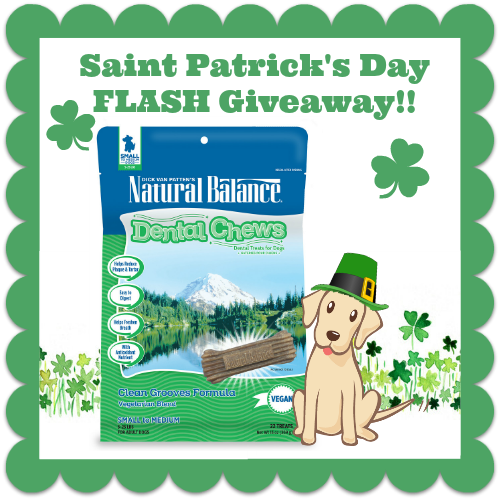 FLASH Giveaway: WIN New Natural Balance Dental Chew Treats for Dogs! Woohoo!!! It’s Saint Patrick’s Day! If you’re feeling lucky, head on over to visit us on Facebook where 3 lucky dogs will each win a bag of the new Natural Balance Dental Chews! You can read all about them in our review post here. To enter, just LIKE this post and then upload your favorite pet photo (hopefully they’re dressing up for St. Patrick’s Day!) on our Facebook Page no later than 10am ET tomorrow morning, 3/18. We’ll randomly select 3 lucky winners who will each WIN a bag in the flavor and size of their choice! Good luck everybody!! !